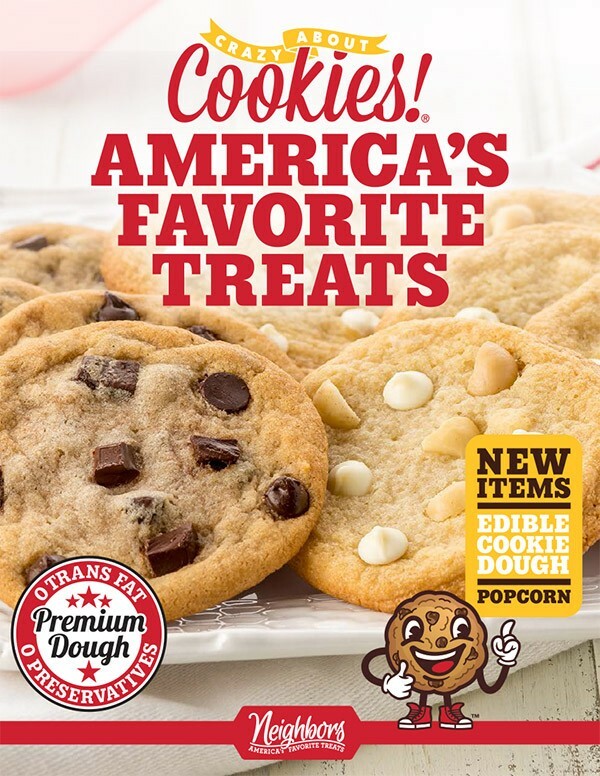 America’s Favorite Treats: The Best of Cookie Dough, Edible Dough, Popcorn and Other Treats! This is a Pre-Pack Program, meaning we pack all of your orders per seller, for an organized and efficient delivery day. OK, Now Let's Check Out The Fundraiser! 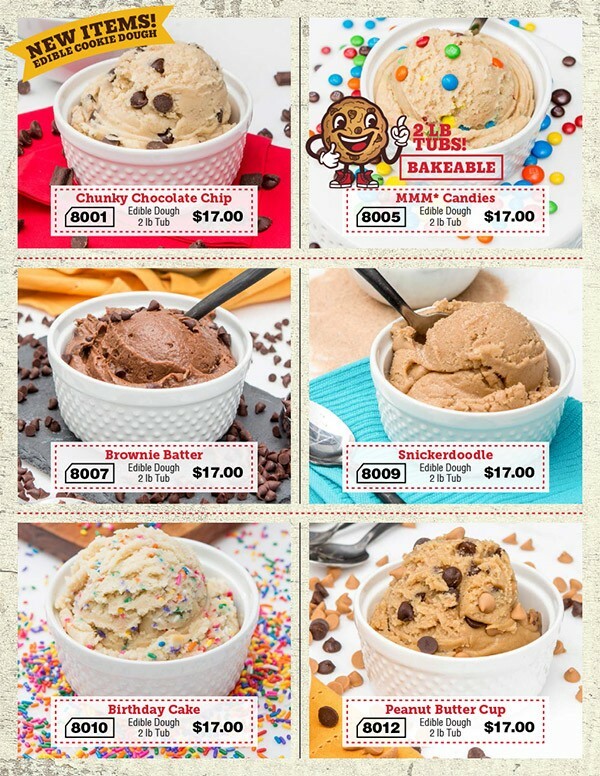 36 Delicious Choices: 14 Delicious Cookie Dough Flavors, 6 Edible Dough Flavors, 6 gourmet popcorn flavors and 10 other delectable treats like cookie dough bites, soup trio mixes, KenChaux organic white rice, Cinnabon baking kits, gluten-free chocolate chip cookie dough and other delicious snacks! Click on the brochure or view the PDF to see them all! 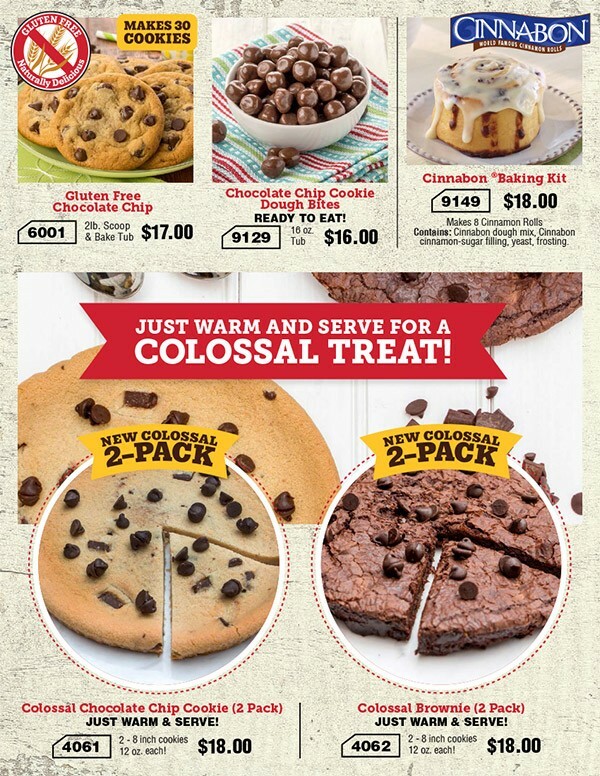 Let your donors spoil themselves with this irresistible cookie dough and ultimate variety of snacks. 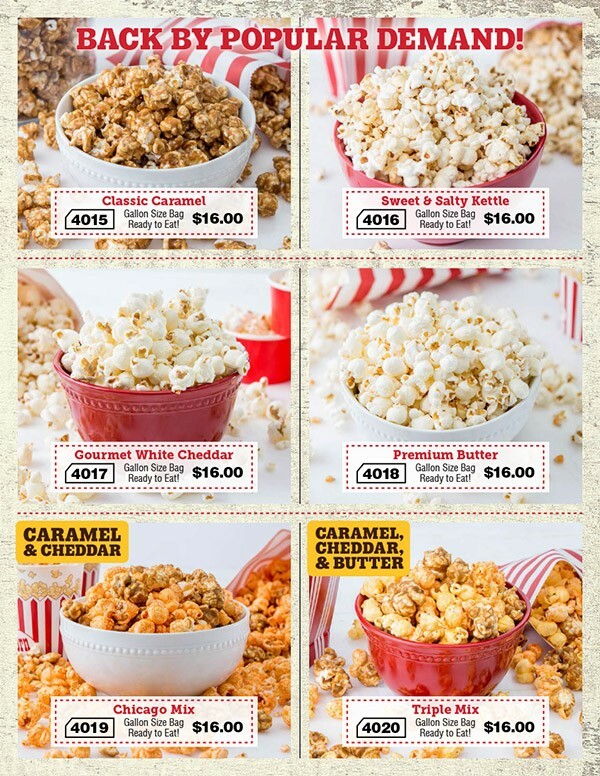 This 8-page brochure features 36 items at a reasonable price range of $16 to $18 with everything from cookie dough to edible dough, popcorn and more! This order-taker features professionally-taken photos allowing these treats to literally sell themselves. We recommend this fundraiser for groups that have 25 sellers or more. Pack-to- the-Seller service is included free of charge for a super convenient delivery and distribution. 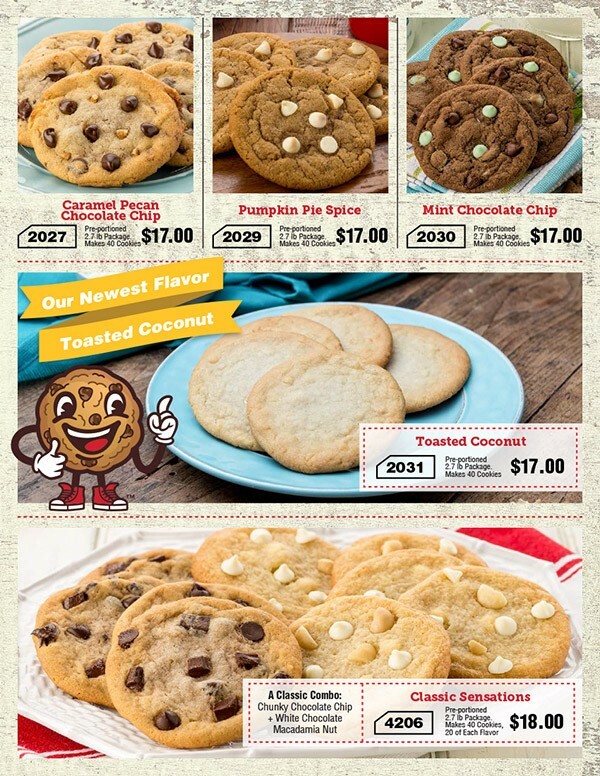 Quality & Convenience: The Cookie Dough may be frozen for up to 1 year and is shelf stable at room temperature for 21 days. It can be thawed and refrozen. Some items may contain traces of nuts. These are all Kosher Products. FREE to Start: The America’s Favorite Treats fundraiser costs absolutely nothing to get started. Simply let us know how many fundraising participants you have and we’ll send 1 order-taker for each of them, at no charge. Reach Your Fundraising Goal: Your profit varies from 30% to 45%! A group of 100 participants can easily make it to the 45% profit mark. Free Shipping and Low Minimums: Your group receives Free Shipping when you sell 150 items or more, easily attainable by even a small group of 50 participants (only 3 items each!). And our minimum order is only 84 items! 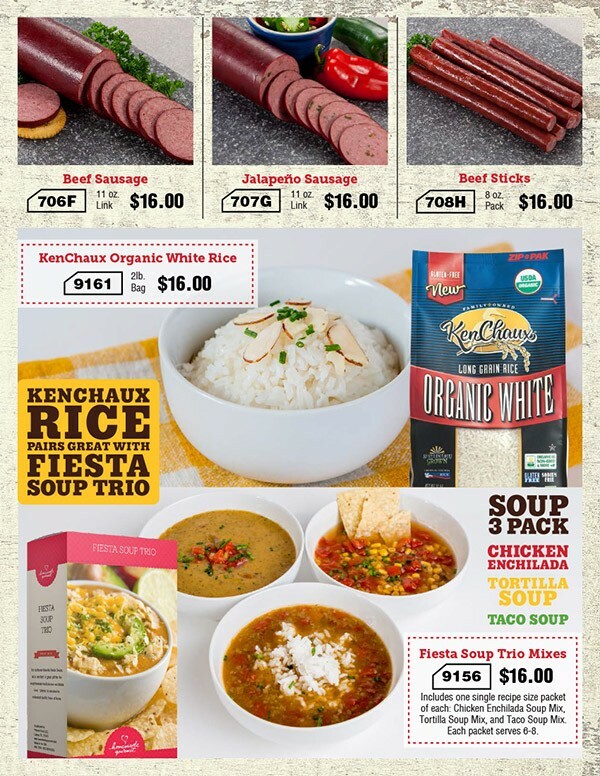 Free Student Pre-Pack with order of 150+ items (otherwise $100 fee): Simply turn in your order forms and let us package your products for you according to seller and team/classroom, for an easy distribution. Distribution day made easy: The cookie dough, edible dough and all other items in this order-taker can be kept at room temperature (77 degrees or cooler) for up to 21 days before being refrigerated again, so there’s no need to have parents and volunteers rush in to collect their cookie dough during a tight 2-hour time window. 1) Make sure every order form has indicated the seller’s name and teacher/coach/group leader name (if you want us to sort by class or team). 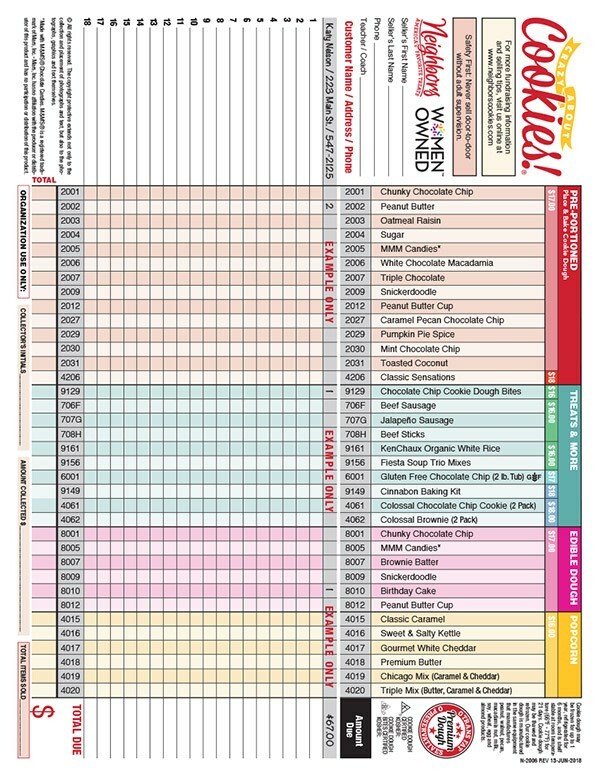 2) Once you’re finished your fundraiser, please carefully tear off the last page of the order form from the brochure. 3) Put them in alphabetical order starting with Seller’s LAST NAME. Group them by class or team (optional). If they are not in alphabetical order there will be an additional fee. 4) Make copies of the order forms, in case USPS loses mail. 5) Mail order forms to packing house (address below). Your Group Keeps Up To 45% Profit! How Does the America's Favorite Treats Fundraiser Work? 1. 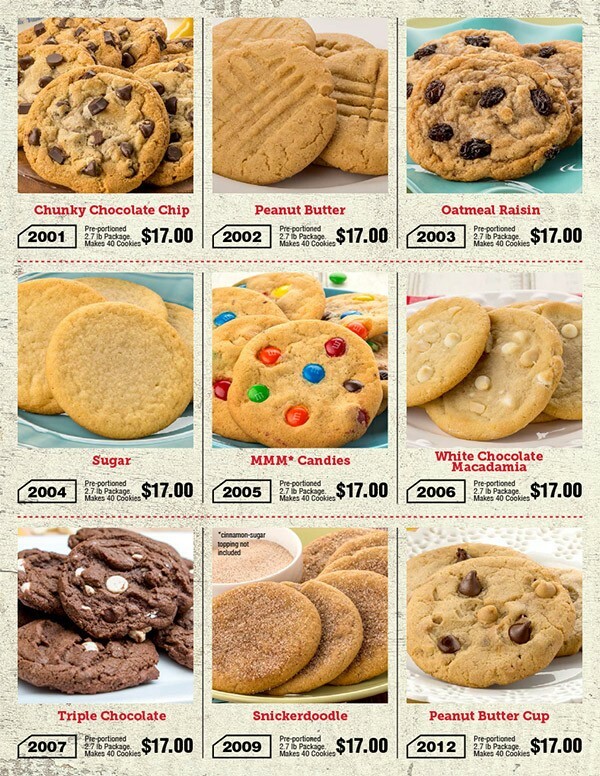 Order 1 America's Favorite Treats order-taker PER fundraising participant – they’re FREE of charge! Our youth football league raised over $3,500 for new uniforms and equipment.